In a Michigan drunk driving cases, statements made by defendant's can be admitted against them at trial. These statements are not hearsay, but a party opponent admission. 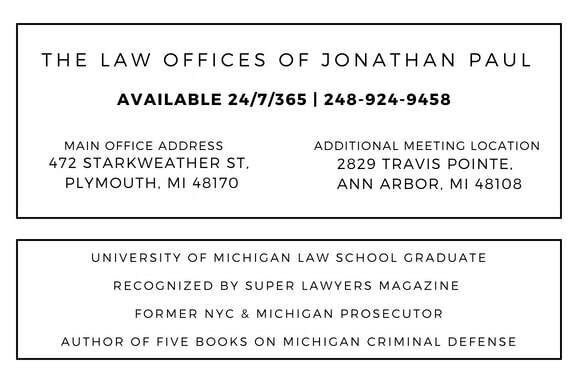 If you've made any statements or a confession to the police about a crime in Michigan , you need an experienced Michigan criminal defense attorney to review those statements, and make a determination about their admissibility. A statement and/or confession can be very strong evidence against you, and an aggressive and early strategy is imperative. The first question to be asked is when and where did you speak to the police, and the circumstances around this interaction? 2) Anything you say can be used against you in a court of law. 3) You have the right to the presence of an attorney. Custody is a tricky concept to understand. The test for custody is an objective one, i.e., given the surrounding circumstances, would a reasonable person have felt free to terminate the interrogation and leave; your age and lack of experience with law enforcement are not relevant. If you're held in police car prior to posting bond is in custody for Miranda purposes, and statement taken without advice of rights must be suppressed. Compare this to a situation where you're not under arrest yet, but volunteer to come down to the police station to give your side of the story. Once these rights have been read, you must be given the opportunity to exercise these rights throughout the interrogation, and must voluntarily, knowingly, and intelligently waive these rights before making a statement. Most police officers will have you orally waive these rights, and sign a written waiver. Any statements made during a traffic stop, sobriety tests or booking do not require Miranda warnings, and you should be mindful that any statements made could and will be used against you. It is not unusual for someone to be charged with drunk driving to make an admission to operating a vehicle and having a few drinks; these statements virtually make out the case against you before the police and prosecutor start their investigation, and put their case together. Along with the content of your statements, the police will make observations of slurred or incoherent speech, which could be used against you in a drunk driving case. It's also common for a Defendant to initiate a conversation or make a spontaneous incriminating statement; these statements are deemed voluntary, and can be used against you. If the police take a statement from you, it could be oral, written or recorded. If you write a statement, you will be asked to put your date of birth, your address and sign the statement. If you and your attorney wish to challenge the admissibility of your statements, you would request what is called a "Walker Hearing". The judge will hear testimony as to the circumstances behind the statement and rule if the statement is admissible based upon the voluntariness and compliance with Miranda. The judge will rule if the statement can be introduced at a trial. If the statement is deemed to be inadmissible, it cannot be introduced at trial against you. - deprivation of sleep, food or medication? - intoxication or under the influence of drugs? Most statements in Michigan DUI cases come during the roadside conversation between the police officer and the driver. The courts have deemed this interaction not to be a custodial interrogation, but rather for the purpose of determining whether the driver is intoxicated; Miranda is not required at this point. Your Michigan DUI attorney will determine when exactly the "conversation" goes beyond roadside investigation, and a reasonable person no longer believes that he or she is not free to leave. If the prosecution's only evidence are the defendant's statements, this violates the corpus delicti rule was put in place to prevent defendant;s from being convicted solely based on a confession when no other evidence is available that proves they committed the offense.